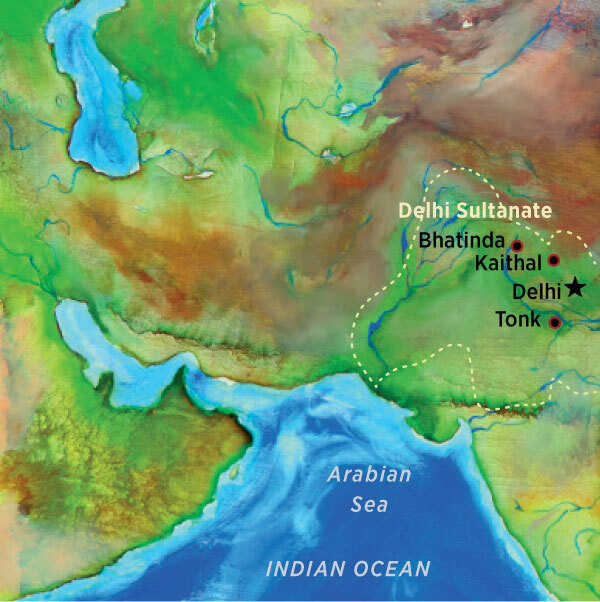 Our second story takes us to the court of the Sultanate of Delhi. Its founder, Qutbu-ud-din Aibek, a Mamluk slave general from southern Kazakhstan, died from injuries sustained playing polo after only four years of rule. His son Aram Shah held the throne only for months before his own death at the hands of forces loyal to his brother-in-law, Shams-ud-din Iltutmish. As Sultan of Delhi over the next quarter century, Shams-ud-din Iltutmish proved extraordinarily able. Backed by the umara chihalgani (forty amirs), the elite corps of Turkic nobles, he extended the Sultanate’s realm from the Khyber Pass, along today’s Afghanistan-Pakistan border, east to the Bay of Bengal, on the opposite side of the subcontinent. He won a reputation for courage, wisdom and generosity while staving off not only usurpers but also the armies of no less a threat than Genghis Khan. The strength of his sultanate allowed for endowments to religious and scholarly institutions, the standardization of a currency and support for poets and philosophers. Near what was to be the end of his reign, in 1229, he received a title and robes of honor from the Abbasid caliph in Baghdad. and most self-disciplined child: Radiyya. of one who seeks justice.